The PTR-1PS pulse transmitting relay is designed to transmit KYZ pulses over long distances up to approximately 4 miles. It provides a 2-wire current loop output and must be connected to a CLR-1PS, CLR-2PS or CLR-3PS to receive the pulses. These units are a functional replacement for the GE DC-1 Power Supply and S-4 Relay, or other older devices used for long distance pulse transmission. The PTR-1PS contains a 3-Wire Form C input (K, Y, & Z). A +9VDC sense voltage is sent from the K input terminal to the pulse-sending device, typically an electric meter, and returns to the PTR-1PS from the Y and Z outputs of the meter. Each time the input changes state, the polarity of the current loop is reversed causing the CLR receiving relay at the remote end of the cable to switch to the opposite state. Wire size in the current loop is not critical but longer distances may be obtained with larger gauge wire. The PTR-1PS has a built-in low voltage transformer isolated powered power supply and may be used with meters having mechanical output contacts (relays), or high or low voltage semiconductor outputs. Typical applications include interfaces between utility metering devices and customer-owned energy control systems, demand recorder applications, and supervisory control systems (SCADA) interfaces. 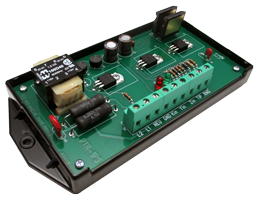 The PTR-1PS relay contains circuitry designed to prevent false outputs from occurring. An incorrect sequence of input pulses is detected and only the first valid pulse will result in an output. Bright red and green LED lamps indicate the system’s status at all times thus allowing a rapid check of the system’s performance without requiring any additional test equipment. The PTR-1PS’s input and output circuit’s terminal strip is a “EURO” type connector. When the stripped wire has been correctly installed in the terminals “slot” no conductive parts are exposed on the surface of the terminal strip. Due to the inherent current-limited nature of the design, no fusing is necessary on the output. No damage will result if the current loop is shorted. The PTR-1PS has built-in MOV transient protection for the solid-state relay contacts as well as for the current loop, eliminating the need for external surge suppression. All component parts that have power applied to them, with the exception of the input/output terminal strip are enclosed in a polycarbonate cover for maximum protection. The mounting base plate is also made of polycarbonate and offers excellent electrical insulation between the circuit and the mounting surface. The PTR-1PS is designed to mount in a suitable electrical enclosure for the application. Input Voltages: 125 VDC input using the DSC-1 Power Supply. Contact factory for other input voltages.